The presentation of 50/50, by our Associate Artist Loo Zihan marked the final leg of our programmes in 2015 with a series of interactive dance classes held over three weeks at 72-13. A Big Thank You for all our “new Lindy-Hoppers”, ambassadors, friends and guests who participated and show their support! We caught up with our participants after each class, in an attempt to find out what they felt towards the classes. We were glad to have received many encouraging comments through interviews and feedback forms. Many shared with us about how they could relate to the themes explored during the classes in 50/50. It was interesting because I personally don’t really have a close relationship with Lindy Hop, but after going through all the different themes, I felt really close and I really want to learn more about the dance, because I have such a great appreciation for it. I was surprised to learn that Lindy Hop originated from African American culture, and it was interesting to see the different variations of Lindy Hop. Have been dancing Lindy for a year and this is the first time I’ve heard a proper discourse on gender roles. Some expressed how intriguing and refreshing this programme is, presenting a dance class through a unique concept. We were incredibly heartened to see how all of you have been excited for this new, experimental format of dance class, and are supporting Zihan, a provocative multi-disciplinary artist with a unique style. Dance is something I love, be it in old or new age, and 50/50 makes it even more fun. I really like the concept of this class, like they started with a bit of Jazz steps, and talk a little bit about themselves, and they move on to contemporary performance, it was very fascinating. Less linear (than usual dance workshop). Less focused on the technique, more on the humanity, stories and memory. During Zihan’s residency at TheatreWorks, along with his three collaborators, Joanna Dong, Sinclair Ang and Jereh Leong, they transformed the space to a classroom and observation area. From 50/50, many shared how 72-13 is spacious and open, yet relaxing and welcoming, offering a unique atmosphere. I like the way it’s spaced out, it feels so open, feels so free, and yet it’s very relaxing. Here’s once again, a BIG THANK YOU for supporting 50/50 and experimental artists like Zihan! Your feedback and comments meant a lot to us, and definitely to Zihan and his collaborators too. If you have more comments on the show, do share with us, in the comments section below or on Facebook and Instagram! We have come to the end of our Main Season Programmes this year! Following this successful run of 50/50, we look forward to seeing you at our upcoming events in 2016. Find out more about our upcoming programmes here. Happy 2016 and see you soon! Did you miss out on the moments during 50/50 by Loo Zihan and his collaborators? Fret not, here’s a gallery to share snapshots of the preview of 50/50 with everyone. Lastly, here’s wishing everyone happy holidays and a wonderful 2016! Let’s hear from our ambassador! 50/50 was an eye opener for me as it was my first time actually learning a social dance and it really puts me in a position where I must interact with complete strangers and to dance with them… overtime I got used to it and deepened my appreciation for social dance and Lindy Hop for that matter. To read on, check it out here. Thank you John for helping out and sharing your thoughts! Last Friday, we presented our last series of 50/50, a collaboration between Loo Zihan and Jereh Leong. During last week’s class, Zihan and Jereh discussed and raised the issue of sexuality, through the use of Lindy Hop. We conversed with some participants after the class and they kindly shared with us their thoughts and feelings towards the show. Every week, participants are welcomed with a question before they enter the class. These questions require them to choose between “Leader” or “Follower”, “Black” or “White”, “Straight” or “Queer”. Through 50/50, Loo Zihan hopes to encourage his participants to think more deeply about their identities, and inspire them to explore and discover more about themselves through the history of Lindy Hop. Last week, 50/50 was featured in The Business Times, Arts and Entertainment section. As elaborated by Helmi Yusof, these were the questions which acted as the impetus of this piece of work. 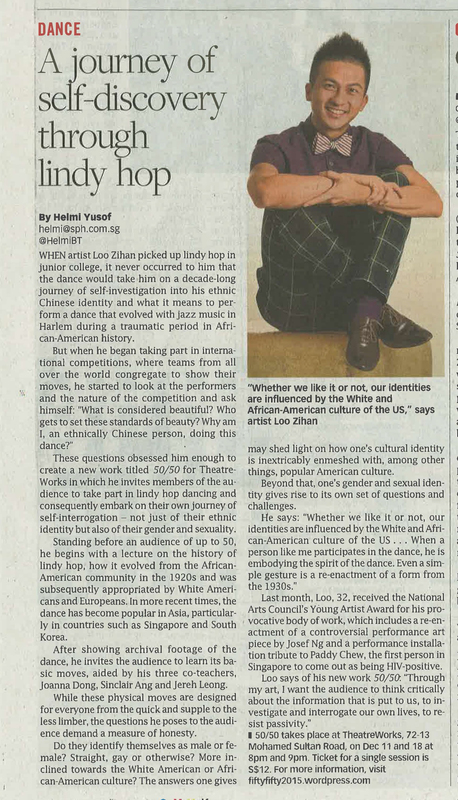 Read on more, to find out Zihan’s journey of self-discovery through Lindy Hop. I want the audience to think critically about the information that is put to us, to investigate and interrogate our own lives, to resist passivity. The Business Times, Arts and Entertainment 11 Dec 2015, Friday by Helmi Yusof. 50/50 will present its third and final class in the series of three this Friday! The class is in collaboration with dancer-performer Jereh Leong, who has had many dance performing experiences locally and internationally. Known for his explicit performances and choreographies, he often addresses the issue of sexuality and gender. Similarly for 50/50, Zihan and Jereh will be relating to sexuality through Lindy Hop. While Jereh was exposed to many dance forms, Lindy Hop was the first dance form he picked up. Jereh Leong was stunning, constantly drawing the viewer’s gaze to his strength and fluidity. He seemed to move in an interstitial space, subtly absorbing and reflecting the various influences. If you haven’t got a chance to catch Jereh in action, do join us for his dance class this Friday! Be sure to gain some insights into Lindy Hop and move along with the two wonderful dancers during the class. Do come on down to 72-13 on 18 Dec, 8pm or 9pm for the last session of 50/50. Tickets are available at the price of only $12 for a single class, and you can register here. Last Friday, we presented the second class of the three-class series of 50/50, a collaboration between Loo Zihan and Sinclair Ang. Given a choice between Black and White, participants were exposed to the way of dancing from different races: African Americans and White Americans. Zihan and Sinclair increased participants’ understanding towards culture and race in the history of Lindy Hop. We spoke to our participants to find out more about their thoughts and feelings towards the class last Friday. It was good, because I’m not a dancer and I never ever dance. The first few times they did it, I could not follow, but at the end, I truly enjoyed it. TheatreWorks (Singapore) presents 50/50, by Associate Artist Loo Zihan in collaboration with Joanna Dong, Sinclair Ang and Jereh Leong.